Milo has now been with us for 4 months. Taken over our hearts and home. Even has his own chair on the patio!!! 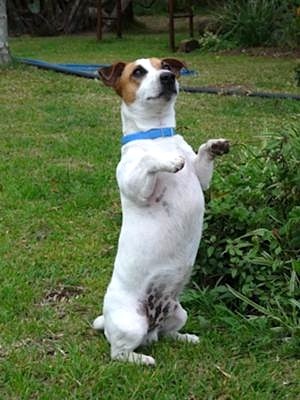 He is a remarkable JRT who can sit on "all two's" for 10 minutes plus without losing his balance. This is his attention seeking pose, please play with me, or pick me up!! !